Building on 50 years of experience, WWF is supporting a variety of projects and approaches to help tackle the major threats facing African elephant populations across the continent: illegal hunting for ivory and meat, habitat loss and degradation, and human-elephant conflict. WWF's African Elephant Programme provides strategic support and gudiance to help guarantee a future for this magnificent species across Africa. Working through WWF's offices in Central, Eastern, Southern and West Africa and with numerous partners, the programme aims to conserve viable populations of forest and savannah elephants in at least 10 range states. 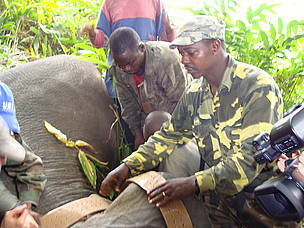 Improve elephant protection and management - by providing equipment and training to anti-poaching teams; promoting the creation of new protected areas and improving the management of existing protected areas; developing community-based wildlife management schemes that contribute to elephant conservation while providing benefits to local people; and determining population sizes. 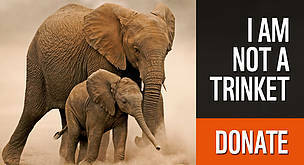 Reduce illegal trade - by monitoring trends in the illegal trade in elephant products; conducting surveys to update data on domestic ivory markets; and working with the WWF and TRAFFIC Wildlife Crime Initiative. Build capacity within range states - by helping range state governments to produce sub-regional and national elephant conservation strategies; developing capacity to survey, census and monitor elephant populations; providing training; and advocating for range states to update and implement legislation to protect elephants. Mitigate human-elephant conflict - by training wildlife managers and local communities to use effective tools; and refining current methods based on what works best in specific situations. 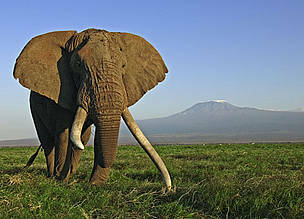 Donate to WWF to help support our African Elephant Programme, and see how your donation helps. Buy a gift of chili, dung and engine oil to help people and elephants in Africa! 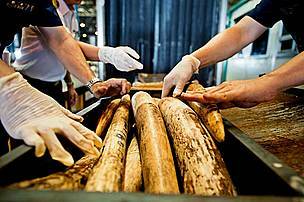 The WWF Wildlife Crime Scorecard report selects 23 range, transit and consumer countries from Asia and Africa facing the highest levels of illegal trade in elephant ivory, rhino horn and tiger parts.